What's Up New Haven: Greater New Haven Chamber of Commerce's "Big Connect" Happens Tomorrow! Greater New Haven Chamber of Commerce's "Big Connect" Happens Tomorrow! My apologies for the extremely late post about this event -- I just found out about The Big Connect earlier today. I hope you have a clear schedule tomorrow because there is an all-day B2B Expo that is happening from 8am-6pm! The Greater New Haven Chamber of Commerce is hosting The Big Connect -- their Annual Business Expo at The Toyota Oakdale Theatre in Wallingford. Great networking opportunity for businesse of all sizes! There are several events in the lineup, including the GNHCC Leadership's Breakfast with Entrepreneur Ruma Bose, Connection Concierge and a CEO Power Panel with Tariq Farid (CEO, Edible Arrangements), Ben Berkowitz (CEO, SeeClickFix), and Gregg Richard (President/CEO, PC Richard & Son). Click here for a list of all events. Another great reason to attend? Most expo events are FREE! The event "The Big Taste" has a $15 fee, but it must be a hit since it's the 5th year they're hosting this particular event. If you have the time, and you're looking to connect with other CT businesses, head on down to Wallingford for this invaluable opportunity! 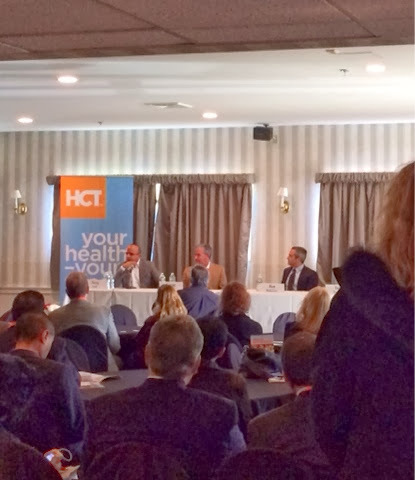 CEO Panel (L-R): Tariq Farid, Edible Arrangements; Gregg Richard, PC Richard & Son; Ben Berkowitz, SeeClickFix.